Here at AP, we're quite fond of Ultimate Ears' MEGABOOM Bluetooth speaker. In our review of it from back in 2015, we found that it was tough, sounded great, and had a nice companion app. The only major sticking point - its MSRP of $299.99 (which it still retails for, by the way) makes it pretty pricey for a Bluetooth speaker. However, Best Buy is currently selling refurbished units of the MEGABOOM for just $129.99 a pop, making it a much more enticing value. 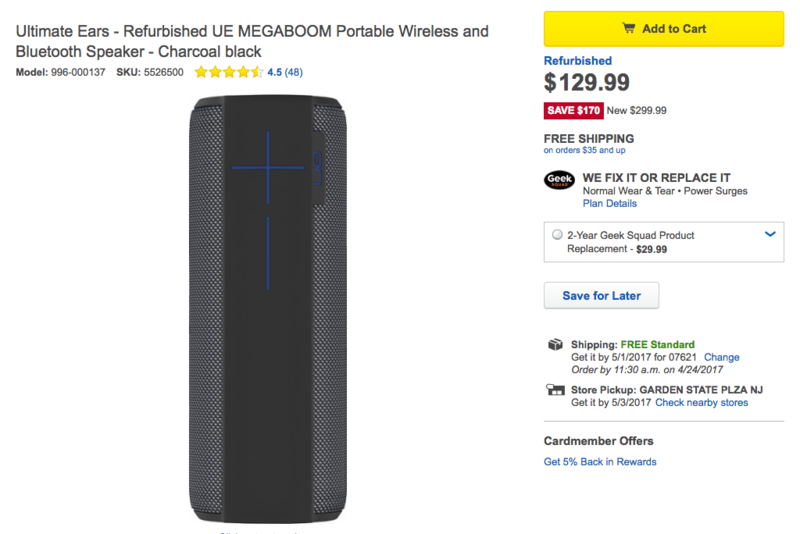 This isn't the first time Best Buy has sold MEGABOOM refurbs, but $129.99 is the cheapest we've seen it being sold for. It's gone for $139.99 and $149.99 in the past from Best Buy, and Amazon currently wants $179.99 for the same refurbished speaker. But at the current price point, you'd be hard-pressed to find a better speaker; the MEGABOOM features loud 360-degree sound, IPX7 water resistance, shock resistance, NFC pairing, and a 20-hour battery. Plus, you can use it with Logitech's new beta companion app, which features Alexa support. Interested? Although there's only one color available, it is the least offensive (and in my opinion, best-looking) Charcoal black with blue accents. Shipping is free, and depending on your location, you may be able to pick it up at a store as well. Hit the source link below to grab one.